We are a small indie team currently working on our first game: HADES 9. When we saw that Unity was hosting the NEON challenge, we saw it as a great opportunity to create a cinematic teaser for the game and show what you can do without an art team but access to the Unity Asset Store :). In the HADES 9 universe, mankind was, until recently, the sole superpower of the galaxy. Now, all that remains is stranded on an alien space station called HADES 9, with only small fleets of gobbled together star ships heading out to find more people and secure resources for the starving people on the station, in order for humanity survive extinction. A concept art piece we have had made for the game. 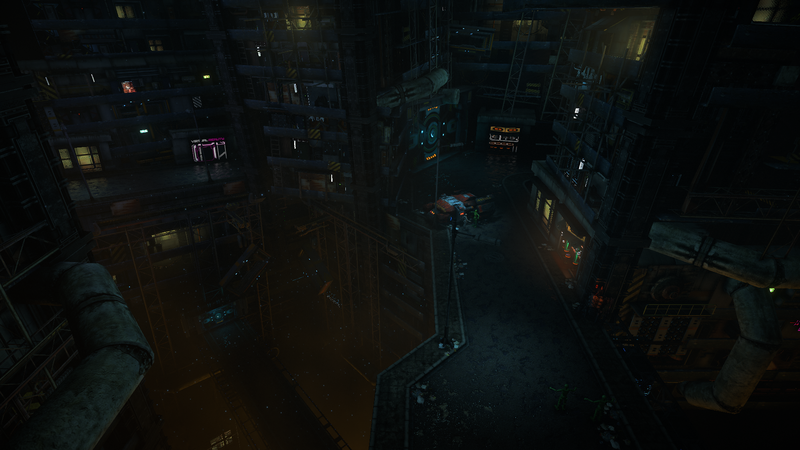 Tightly packed cyberpunky slums with greek cultural influences. When we started putting together the concept for the station, we looked to two franchises primarily: Battlestar Galactica and Blade Runner 2049. Battlestar Galactica is our primary inspiration for the portrayal of hopelessness, and the slow decline of humanity, both on the station and in space. For the graphical style and design of the slums, Blade Runner was our primary inspiration source. Like in the movie, we are aiming to make the slums still feel like they are in a casually high tech era, but one that has seen much better days. Work in progress shot of the slums seen at the start of the video. Since the fall of man, death and sorrow have been a constant companion for those who survived on HADES, something we wanted to heavily empathize with the trailer. To this end, we went through various scripts for the scene, often with some kind of action such as combat. In the end, we decided to almost the exact opposite: a much slower paced dramatic story of a little girl being left behind by her father in the slums and decay of HADES 9, while he heads to his probable doom in order to secure resources for the station. An earlier version of the hallway with the corpse she runs through in order to reach her father in time. After we had the rough script, the next big thing on our to-do list was the lighting. After some experimentation, we decided to go with a pale blue and industrial orange lighting as out primary colors, which empathize the cold and uncaring feeling of space and the industrial slums most people are now forced to live in. While HADES has no real outside, we still use a pale blue to complement the mostly industrial orange artificial lighting. The second decision was to use dark areas. Since we use almost exclusively Asset Store content and we have no real artistic skill, we decided to us dark areas in order to hide areas we couldn’t make look nice, such as were 2 assets intersect. Earlier version without the lighting and dark areas we decided upon. Since we started work on HADES 9 we have had the issue that we had no one on the team with any sort of great art or modeling skills. So the discovery of the Asset Store was a godsend for us! Since then, we have been very busily acquiring every single great asset we could use to make development easier for us. Some of the most important assets have definitely been the starships we acquired. Not only can we use them for the RTS aspect of the game, we can also use them in the RPG part of the game as great set pieces for various scenes. With all these assets in hand, we have started to go through a process we like to call “creating jank”. Janky stuff is basically us kit-bashing a load of different asset packs together to create the environments we love without the need for a professional artist. Another look at the scene where the kid will run and trip. None of this has been made by us, but by kit-bashing various asset packs, we were able to make a very convincing spooky sewer-like or maintenance tunnel environment. The first rough versions were finished. Some parts, like the gates, progress rather quickly because we had many good parts to work with, while the bar required a bit more tinkering on our part. First version of the gate house was done fast, though it would change rapidly and constantly until the finish line. The full blockout for the scene was redone slightly to give it more detail. Notice how we use ships both as sort of buildings and to transfort the scene into a sort of harbor. Finished the street scene, though it needed better lighting and such. The bar modeling was done here. Lighting and NPCs still needed to be added. Street was finished now, with light effects and such where we liked it. Giving it a gritty feel but also hiding some of the weaker points where needed. The bar was given a bit more detail and the NPC were added. These green and grey puppets turn into randomized patrons when the scene is played. It also, again, shows how ships are made part of the scene. The gate was given more detail, though this would change a lot still. First more colors and neon, but then later toned down. The slums have been given more detail here, almost done. Bar area is now finished, NPC’s in on new locations and the scene was scattered with some random junk to give it a bit more of a run down feeling. The final version of the Gate scene. A lot less neon here, and the noodle shop has been removed for a more industrial look. The crowd was added so it looks like a proper send off for the carrier that is about to leave. The NPC’s spawners have been added for random civilians, and the lights have been re-tuned a bit. Final bug fixes and little upgrades have happened in all areas, and the video has been recorded. The music and voice over are now going to be added and then it’s done! We started out with just 2 models, one very high-quality player model and high-quality troopers you can see in the scenes inside the ship. Those were not really what we wanted to use for the random civilians, however, so we worked with UMA and some sci fi uniform packs and used that to generate the random civilians on the street, as well as some of the character on the ship. The slums scene. All the green and grey models on the ground turn into Morph 3D characters. Their animations were done with the “Human Pedestrian Animations” asset. Part of the marketplace scene, these animations were part of the “MarKet Social Motion Take01“ asset pack. Each camera placement was pre-planned. They are either there to make a scene look much larger than it is, or almost claustrophobic, further enhanced by the light effects, and at the end, the massive capital ship leaving the dock. Cinemachine was very nice to use. We obviously used it as our camera controller but, more importantly, we used for hot swapping the post-processing stack. This made our scenes look much nicer than if we had not had access to the tool. Timeline was very nice too, once we got the hang of the functionality, it was a great help to organize the teaser. We definitely plan on use both more in the future. Thanks for watching our cinematic teaser, we hope you liked it! @Blair Renaud the idea was he left her with someone that morning with this note, expecting to be gone by the time she woke up.